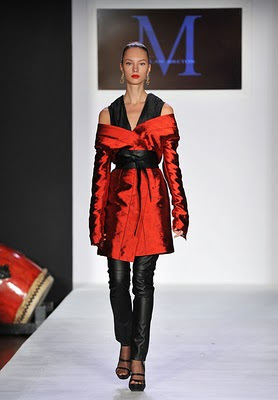 An off-the-shoulder Kimono-style jacket from the Fall 2011 collection of Malan Breton. Photo by Slaven Vlasic/Getty Images. THE last day of Fashion Week. By Day 3, those on their grind can’t wait until it comes, yet when it does nostalgia begins to set in. Last day was interesting for several reasons. A young cat, Malan Breton, and an old lion, Ralph Lauren, opened the proceedings. Both took inspiration from the east – Japan for the former, China for the latter. A get-up from the "Ragga Muffin Girls" section of the Fall 2011 L.A.M.B. collection. Photo by Frazer Harrison/Getty Images. What of that huge gap between shows in the tents? It was five hours! When was the last time there was that long a stretch between shows? This observation brings up the matter of more designers choosing to show outside of the tents. Like Day 5, last day marked the appearance of a number of big guns. The aforementioned RL and Calvin Klein Collection were among them. By now the fashion set is accustomed to this duo showing off site, but not so much Isaac Mizrahi and Joanna Mastroianni. And, and is it not time for Bill Blass to return to the fold? These notable absences account for the time gap. Of course, no designer with a yard of business sense wants to show when the major tastemakers, buyers and media are elsewhere. One hopes this can be rectified by September. The little black dress was one of a few surprising looks from the Fall 2011 Ivana Helsinki collection. Photo by Jemal Countess/Getty Images. Meanwhile, the tents survived the gap, and Elene Cassis got the party restarted with a competent show that paid homage to the New York City skyline. Naeem Khan followed with more than one or two showstopping dresses and gowns. The two most surprising shows were L.A.M.B. for its showmanship, and Ivana Helsinki who seemed to be quite a different designer – and that’s a good thing – from the one who brought Fashion Week to a close in September.